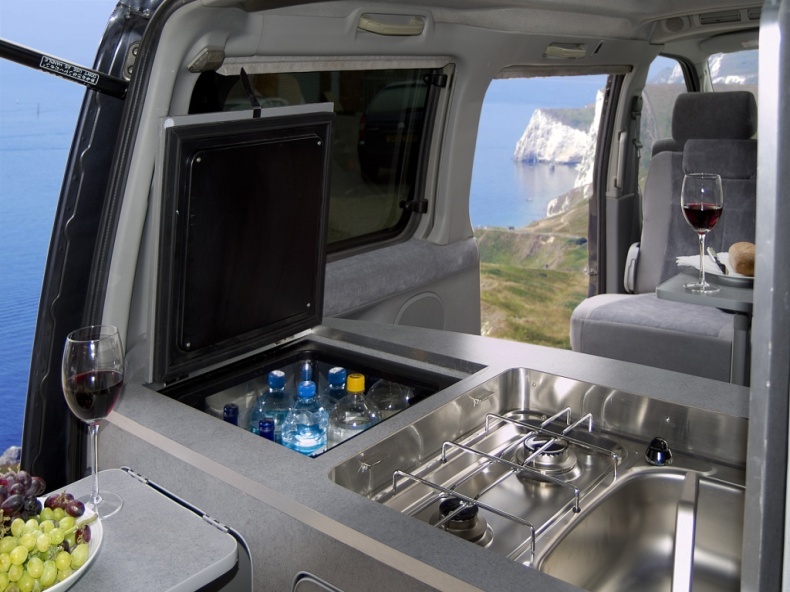 Positioned in the middle of our highly acclaimed range of campervan conversions based on the Mazda Bongo, the Purbeck is the latest to offer a rear kitchen conversion. It maintains the Imperial tradition of providing an unbeatable combination of efficient and thoughtful design with a highly appealing price. 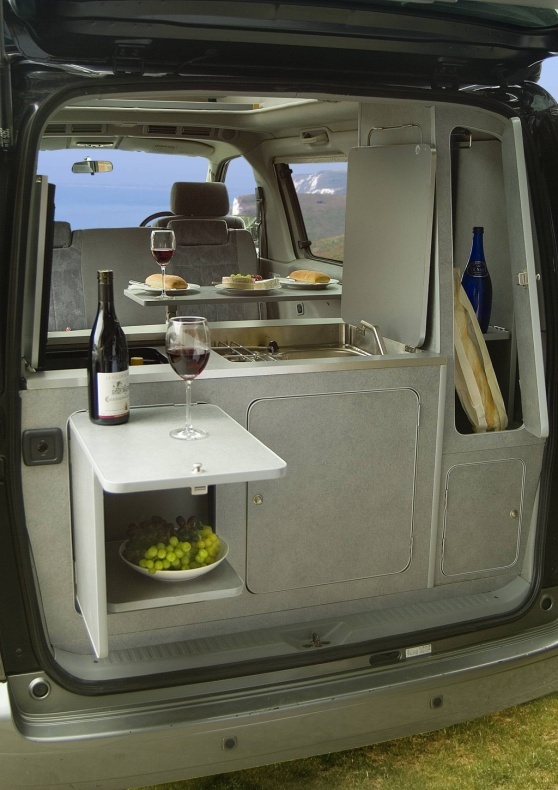 The layout reflects traditional campervan values, but the implementation benefits from several decades experience of incorporating flexible facilities into a compact and highly manoeuvrable platform. Sporting a kitchen that is equally suited to interior or exterior use, the Purbeck offers the promise of the great outdoors along with the reassurance of a wholly self-contained interior in less clement weather. 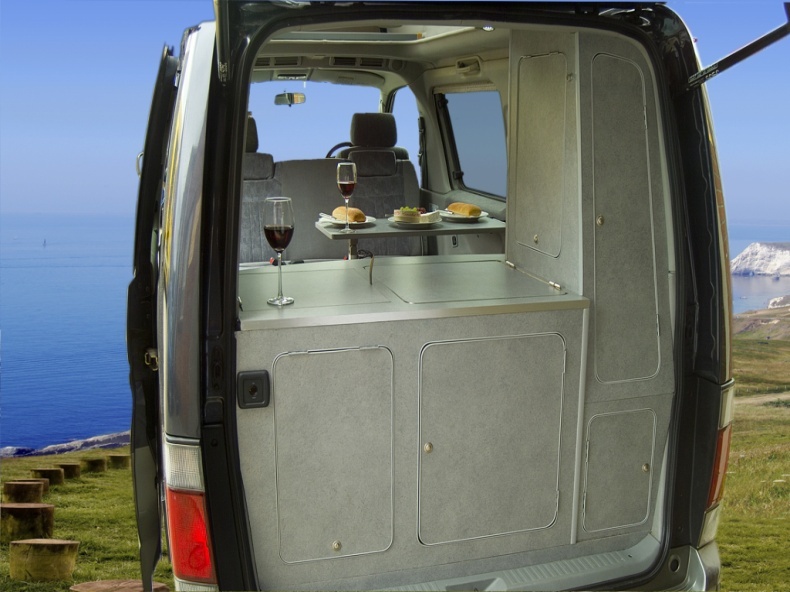 Even more space is available to an al fresco chef, thanks to the ingenious fold-up table and shelf incorporated into the rear panel. Even the storage cupboards open both front and rear. The portable 10 litre tank with submersible pump is a highly cost-effective source of on-board running water requirements, while the adjacent gas locker accommodates a Campingaz 904 bottle. Does it have a “fridge as well as the kitchen sink?” Of course there’s a refrigerator! The Waco 36 litre compressor unit will respond immediately to your sudden impulse to take the kids away for a sunny weekend’s camping. An Elecsol 100 amp battery provides on-site power for the refrigerator, lights and other 12 volt accessories when there is no mains hook-up. When there is, electrical power is managed by a control unit with LED display and, safety once again, an RCD and trip switches. In addition to the comfortable travel seats there are forward and side facing seats for lounging and dining. You can easily sit four people round the table. Storage lockers feature tambour doors so you can’t trip over them when they’re open. There is an option to add a rear drive-away awning if additional space is needed. Low energy LED lighting casts a cool glow as the evening draws in. The original travel seat easily folds down to provide a full-width bed, together with an integral slatted base, making bed set up time a mere 10 second operation! 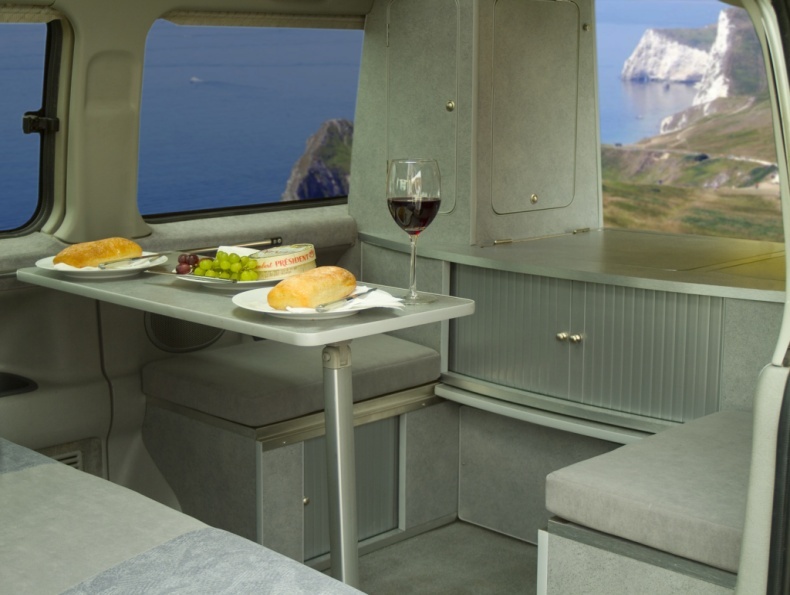 The Purbeck offers you the luxury of a 4’6” x 6’6” (max) sleeping area. Couple this with the option of reupholstering the seat for a totally flat bed and you are guaranteed a perfect night’s sleep. As with all rising roof Bongos children will love their own cosy overnight perch in the roof. Even tall adults might choose to stretch out in that 7ft bed length. All models boast built-in blinds, most being electric which operate at the flick of a switch letting you move seamlessly from admiring the sunset to enjoying the cosy interior. Innovation and invention need not break the bank. You can be heading for the hills in a Purbeck from only £8,995. With its purposeful stance and agile nature, the Mazda Bongo is designed for modern day driving – 365 days a year. Compact enough for day to day use, school runs and the supermarket car park, it instantly transforms into the perfect family camper for impromptu day trips, weekends away and brilliant holidays. The Bongo requires no more space than an average family saloon, with easy precision parking thanks to a strategically placed rear mirror. Front and rear air conditioning enables drivers and passengers to relax and stay cool as they follow the sun. 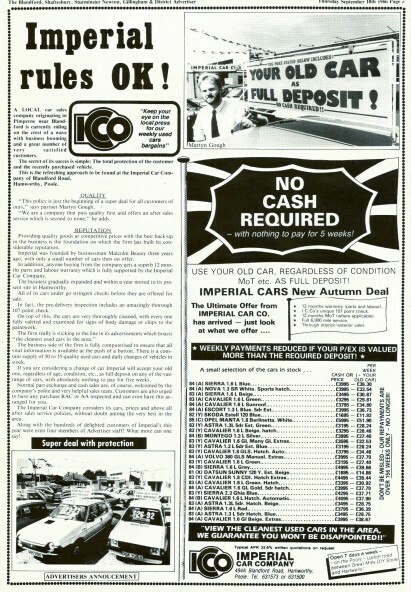 Central locking, electric windows and power steering can be taken for granted, and ABS, unusual in campervans at this price, provides welcome reassurance. Tinted windows, alloy wheels and 4-wheel drive are also available. Cab and rear air conditioners, automatic transmission, electric elevating roof, radio/cassette, power steering, electric mirrors, right hand drive, folding leg table. The original seat is reversed to provide unprecedented levels of accommodation. We then fit lap belts so passengers can be carried in safety. Furthermore, the optional Comfort Pack includes reupholstering the seat giving a full-width flat bed for a perfect nights sleep.